Hi! My name is Dan. 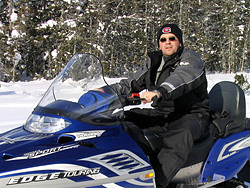 I am the owner/operator of Newfoundland Outdoor Adventures. I would like to tell you a little about myself, my training, my experience and the local area. One of my earliest childhood memories of the outdoors takes me back to about the age of 5. I was in the woods with my Dad cutting firewood and setting some rabbit snares. I remember him showing me a fresh set of moose tracks and while he was telling me all about moose, I was praying that we wouldn't see it because I was so scared. We spent many days snaring rabbits, cutting wood and walking around. These early days in the woods with Dad is where my love for the outdoors started. Over the years doing these different activities with Dad, whether it be snaring rabbits, cutting firewood, riding or trouting, my love of the outdoors grew stronger. When I got old enough to drive an ATV and snowmobile I spent even more time in the woods with Dad because after we would check our snares, Dad would cut the firewood and I would haul it home with the ATV or snowmobile. It is this period that I remember sharing with the rest of my family. It was always considered a family outing, with my Mom and my younger Sister and Brother. When I turned 16, I got my first gun and a couple of years after this I got my first hunting dog - a Beagle named 'Susie' (who still lives but has since retired from hunting) and this is when my love of hunting really started. These days I also have a Black Labrador Retriever, 'Romeo', a Beagle, 'Copper' and a Beagle cross, 'Pete'. Aside from my hunting and fishing trips with my buddies, most of my outdoor time is now spent with my wife, Janine, and our daughter Madison (born on May 09, 2004). Janine loves to go trouting, camping, ATV and snowmobile riding and especially loves canoeing. We are both introducing our daughter to these wonderful activities and hope that she is able to get the same enjoyment from them that we do. As I write this, Madison is 5 months old and already loves being outside and riding ATV. Clck Here to Learn More! I am now in my early thirties and have been involved with outdoor activities for most of my life. I have hunted and fished in Newfoundland, Alberta and British Columbia. I graduated from a 30 week guide training program in Grand Falls. I have worked as a Salmon Fishing Guide in Labrador and a Hunting Guide in Newfoundland. I decided to start Newfoundland Outdoor Adventures because of my love for the great Newfoundland outdoors! I wanted to be able to share my experiences, knowledge and love of these activities with others, while still being able to earn a living. Each and every time I go out, whether I'm riding, hunting, fishing, camping or photographing, I still get the same thrills and enjoyment as I did at the early ages with Dad. We are strategically located on the Bonavista Peninsula, one of Newfoundland's most scenic tourism areas. We have access to hundreds of miles of open country, trails, logging roads and abandoned railway. 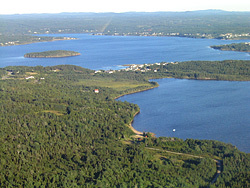 There is an endless number of rivers, ponds, lakes, bogs, barrens and forest areas. No matter what season it is, this is the ideal destination for a relaxing getaway where you can have a great time ATVing, snowmobiling, fishing, hunting, hiking, camping or canoeing. And of course, during your adventure, experience one of Newfoundland's great traditions - a 'boil up'. If you have the desire to experience a part of the great Newfoundland outdoors, and you get the same enjoyment that I do, or you want to experience for the first time this enjoyment, then contact us and we'll do everything within our power to make it an enjoyable experience. Please remember, wherever you go, leave only your tracks!